As shown in Figure 6.6, traveling to the Moon is a multi-step process. The first step is to achieve low Earth orbit (LEO), nominally set at 100 nautical miles or 185.3 km. From that orbit spacecraft can achieve higher orbits or be injected into a lunar or planetary transfer orbit. The International Space Station (ISS) is nominally in a 275 km (148.5 nautical miles) orbit. All of the calculations performed in this section for lunar transfer orbits were for a 275 km circular Earth orbit. So the first step is to determine the requirement to reach a circular Earth orbit. 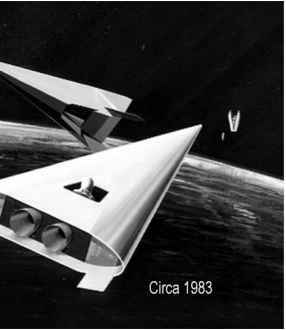 For that a single-stage-to-orbit (SSTO) launcher was selected, as this is the most demanding. Figure 6.6. 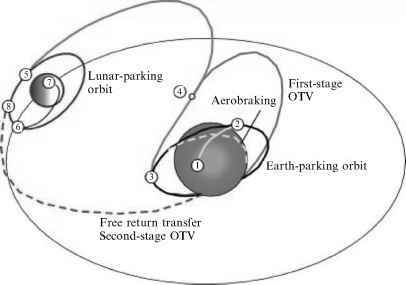 Transfer trajectory from Earth orbit to lunar orbit from a brief by V. Gubanov at the European Space Conference in Bonn, Germany, in 1984. A two-stage-to-orbit (TSTO) launcher will have lesser mass ratio requirements. Table 6.1 gives the launcher requirements for LEO with a SSTO launcher. Achieving even a modest airbreathing capability can reduce the liftoff mass of the launcher by a factor of 2, simultaneously reducing vehicle size and propulsion system size. With a lesser oxidizer load and an operational design focus, the possibility of more frequent and lower cost to orbit is a reality. In terms of Moon missions, the propulsion advances associated with the launcher have the greatest impact. With respect to the in-space operations the options available in the near term are about the same as for the Apollo missions. Table 6.1. Launcher requirements to achieve circular low Earth orbit.